Anyway, this was one such meal that she made for us a lot when we stayed with our grandparents. It’s simple, flavorful, and healthy, so mama’s trying to get veggies in kids won, and kids not wanting to eat too many veggies won! 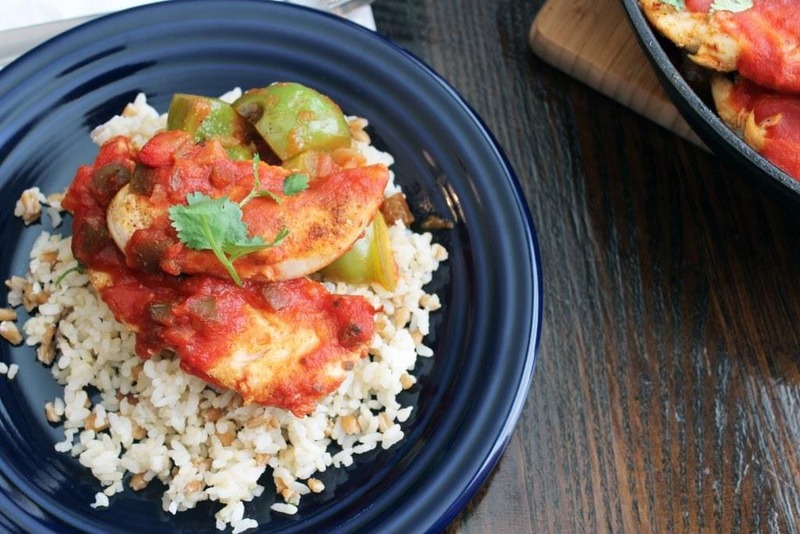 Baked chicken and veggies with a homemade Mexican spice blend in salsa. YUM. Let’s do this. You need chicken tenders! Or pieces of any kind of chicken you like. 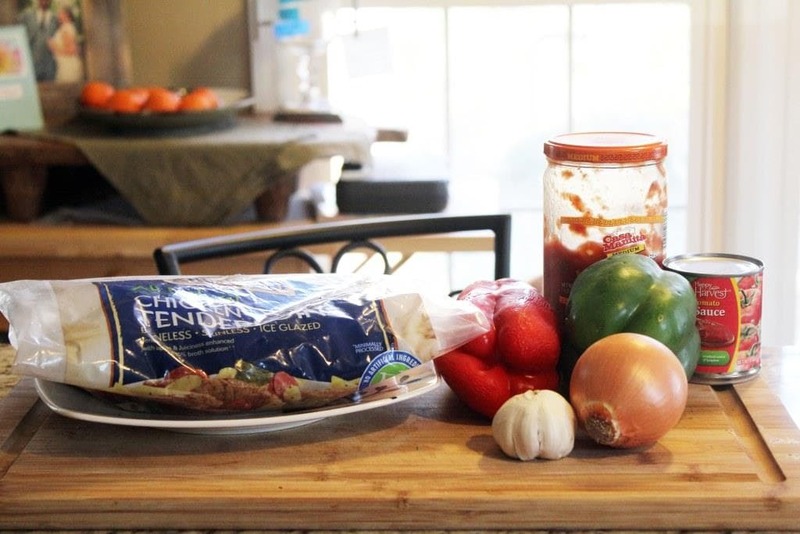 Also bell peppers, onion, garlic, jarred salsa, and canned tomato sauce. 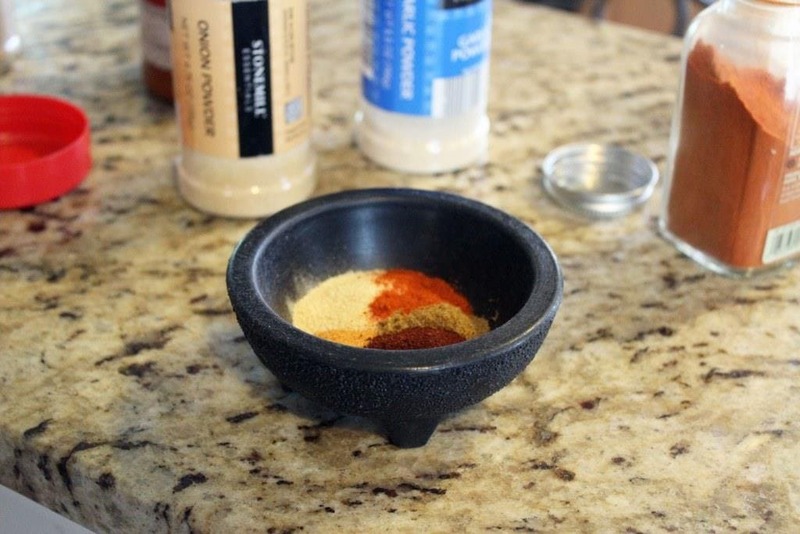 For the spice blend, you need cumin, seasoned salt or regular salt, garlic powder, onion powder, chili powder, and cayenne pepper. 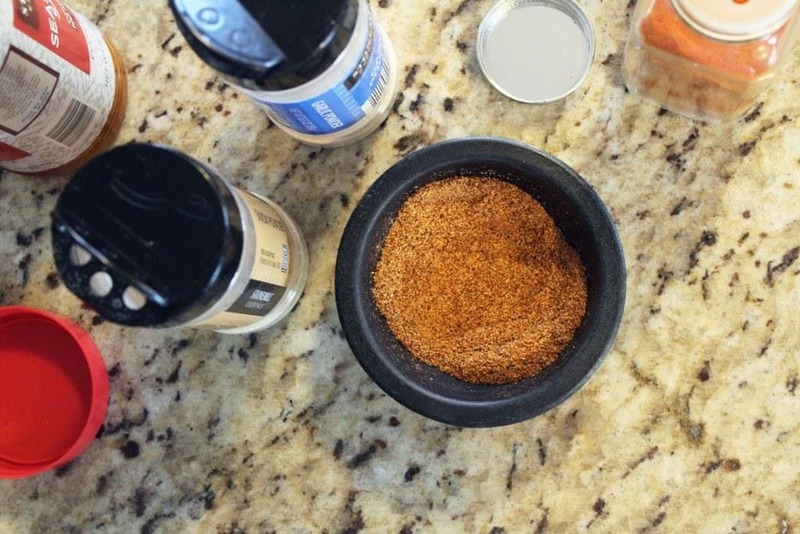 Add the spices to a small bowl. Blend the spices together with your fingers. Sayonara taco packet – this is those spices with better flavor and no chemicals. NICE. 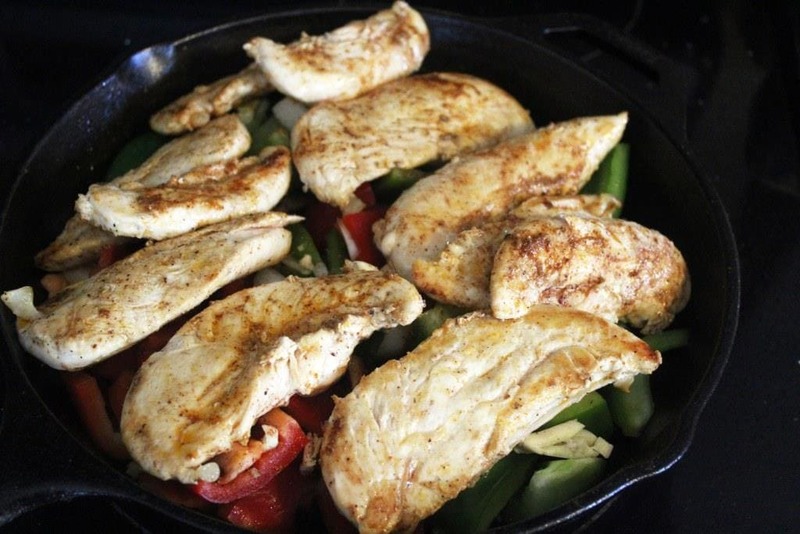 Preheat an ovenproof skillet to medium-high heat with a drizzle of olive oil. Preheat the oven to 400F, too. Now, let’s prep the veggies! Halve the peppers and pull out the seeds and stem. 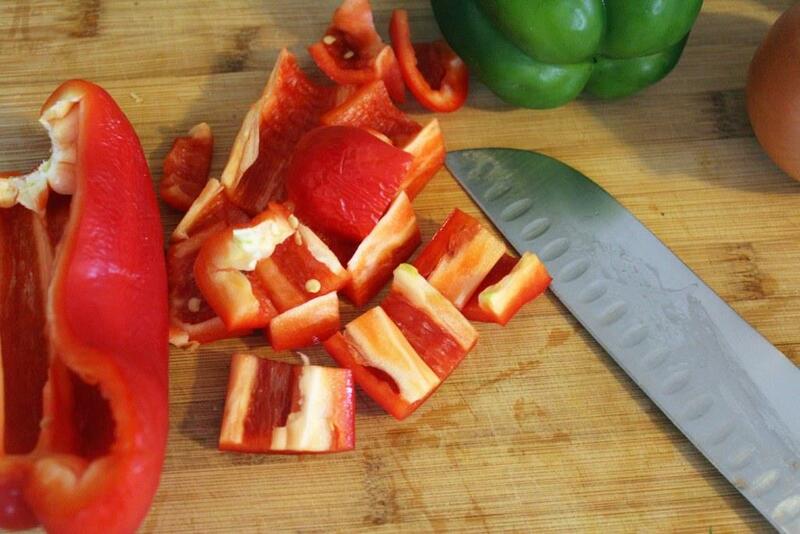 Then, cut the peppers into big strips and the strips into chunks. 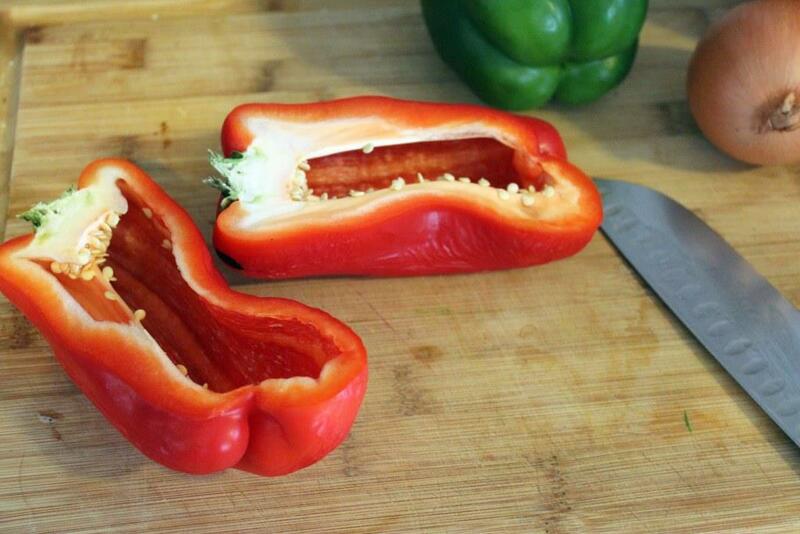 Do that with both peppers, and cut the onion into chunks, too. 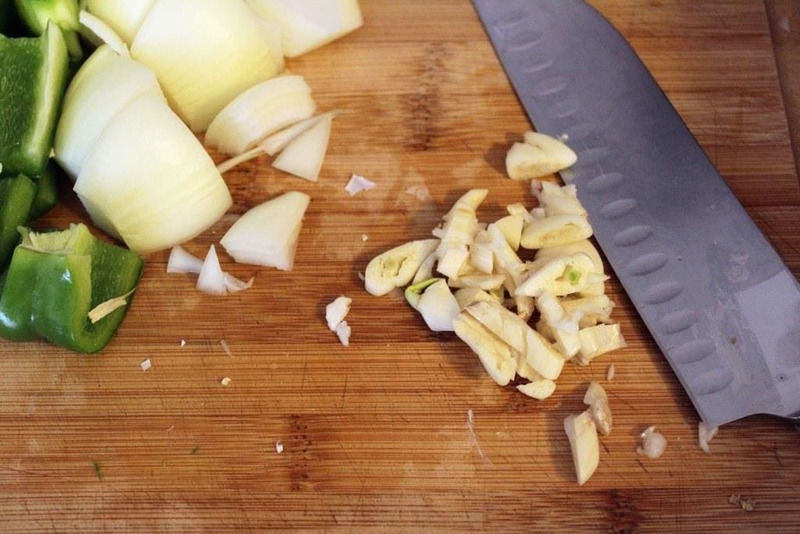 Now, use the side of your knife to mash the garlic – this helps the peel come off easily. 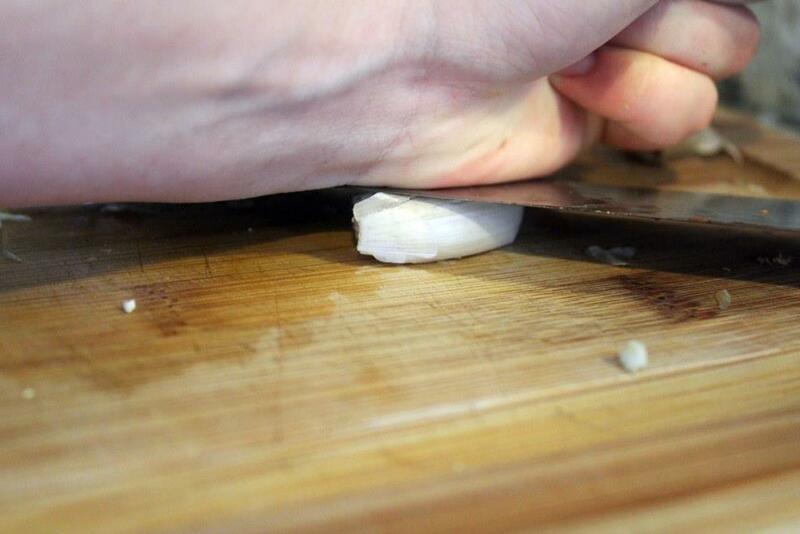 Peel the garlic, and roughly chop it. Now, let’s start the chicken. Add the chicken, and sprinkle it with the seasoning blend. We’re going to brown the chicken but not cook it all the way through. After 2 minutes or so, check the chicken. Is it brown on the second side? If it is, turn it over and brown the second side! 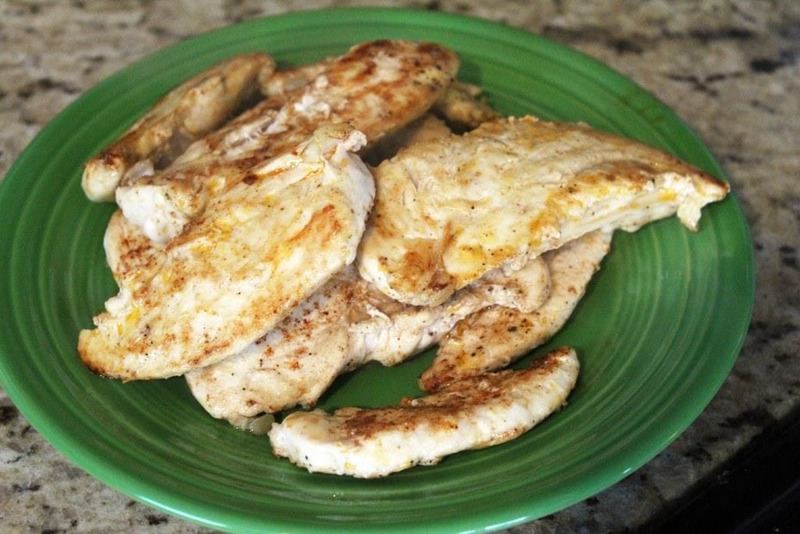 When the chicken is browned on both sides, remove it to a plate. 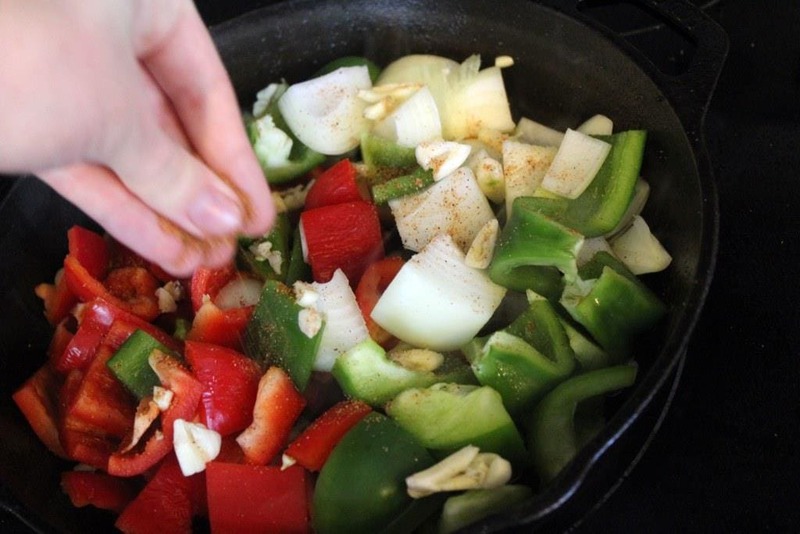 Add all the veggies to the drippings in the skillet. YUM! Veggies that taste like chicken tacos. 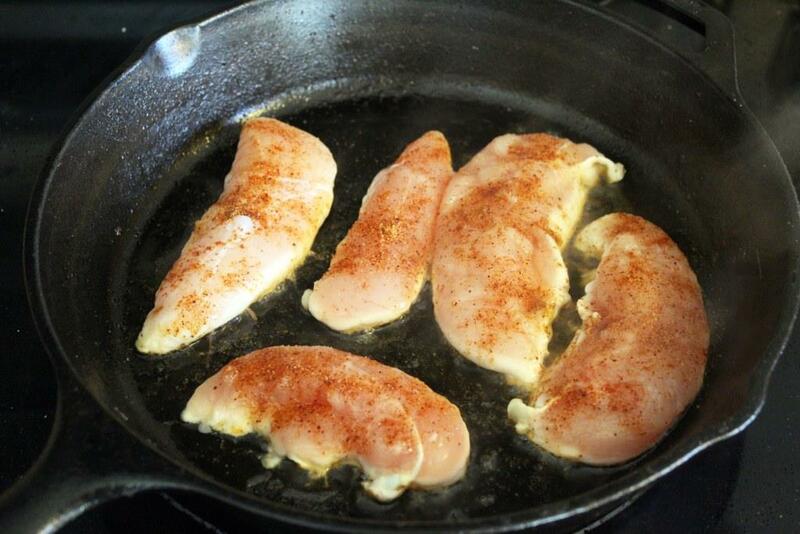 Turn the heat off the skillet, and sprinkle them with a bit more of the seasoning blend, then stir them around. Add the chicken back to the pan over the veggies. 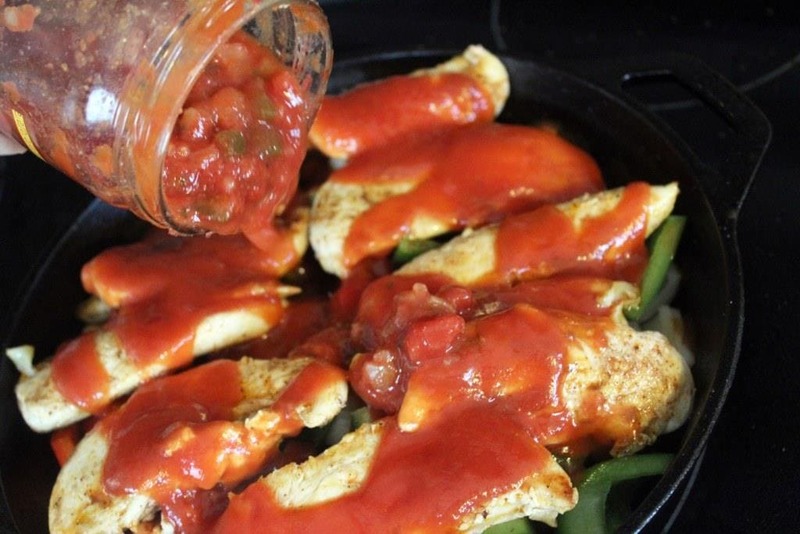 Then, pour the tomato sauce and salsa right over the whole mess. Now bake! You can make the entire dish up to this point, stick it in the fridge, and bake it whenever you’d like. 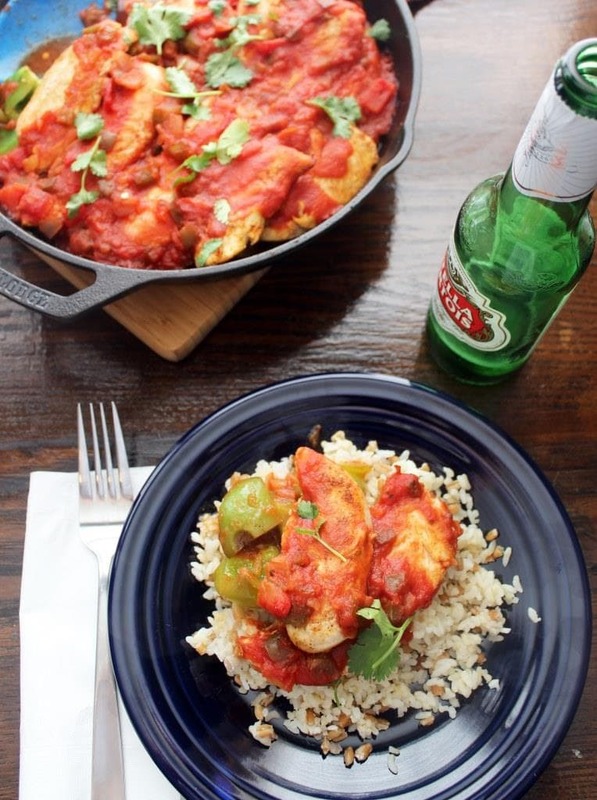 Bake the dish for 15 – 20 minutes (or longer if you use large pieces of chicken) until the chicken is cooked through and the sauce is bubbly. I love this. It’s simple, the flavors are epic, and the veggies don’t get all crazy-baked since we only cook them in the last baking step. I serve this over rice with some cilantro over top, and LOOK. 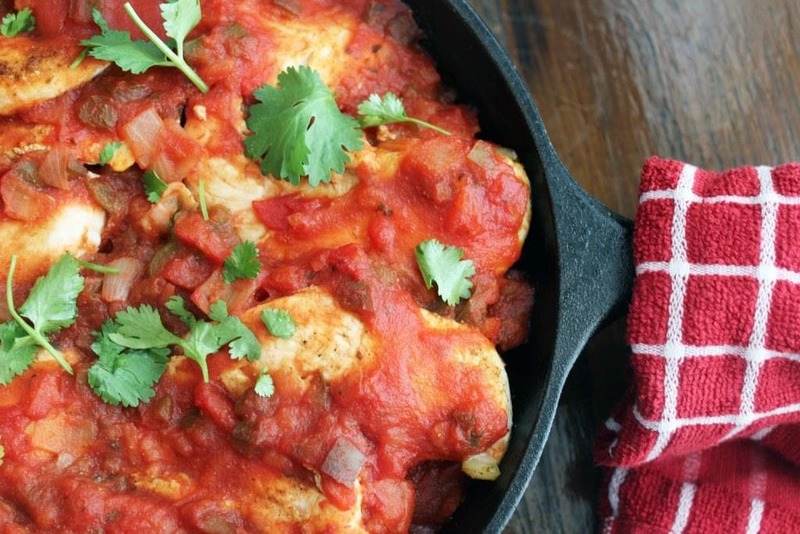 This is so simple, and hugely flavorful – wonderful for ANY dinner. I’ve eaten this with rice, like in these pictures, or with corn tortillas for wrapping, or just with lettuce and some lime juice on the side for a lighter option. Try this soon! It’s a childhood fav of mine, and you’ll love it too. Preheat the oven to 400F and and ovenproof skillet to medium-high with a drizzle of olive oil. 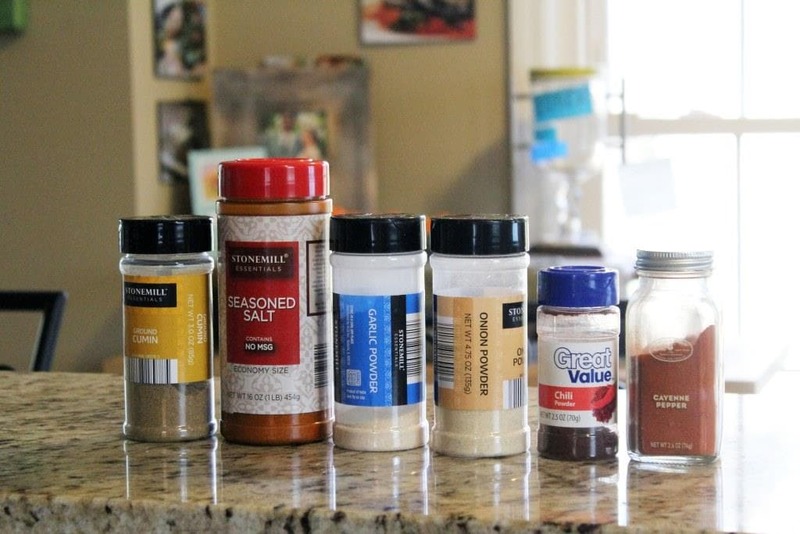 Combine all the spices in a small bowl. 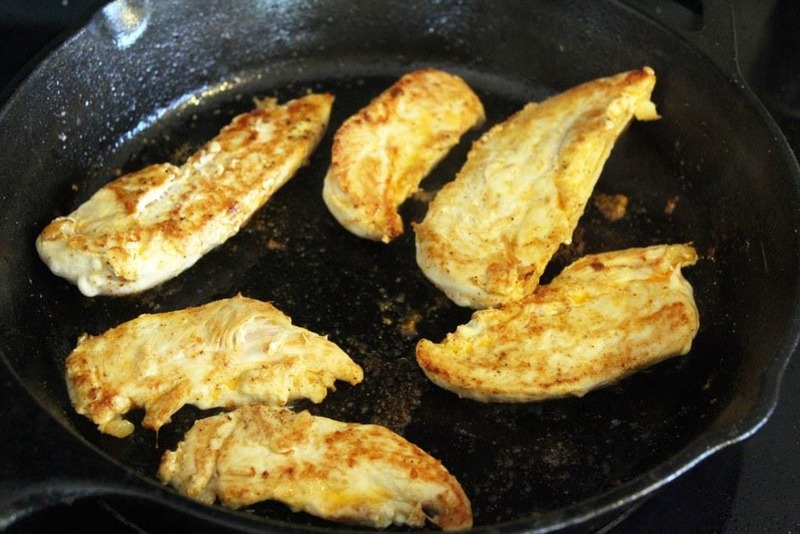 When the skillet is hot, add the chicken in 1 layer with a sprinkle of the seasoning blend. Let the chicken cook for 1-2 minutes, then flip when chicken is brown. Brown on the second side, then remove to a plate. Brown the chicken in multiple batches if you need to. 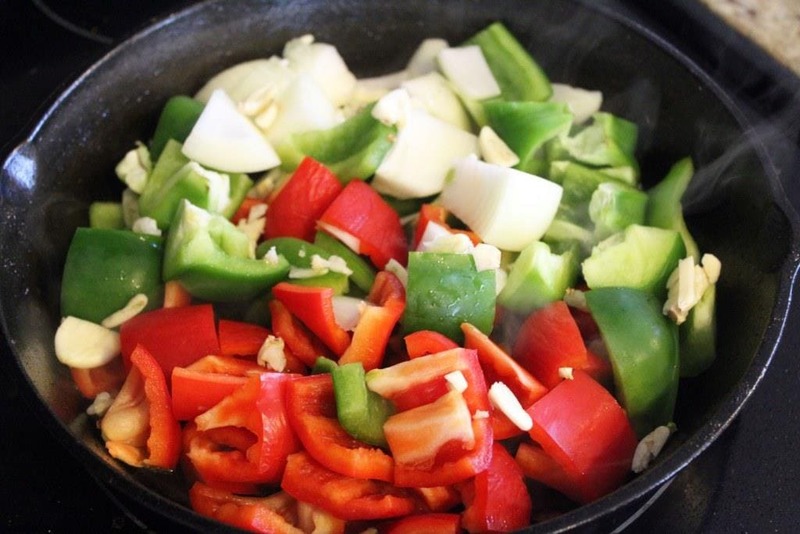 Add the vegetables to the hot skillet, and turn off the heat. 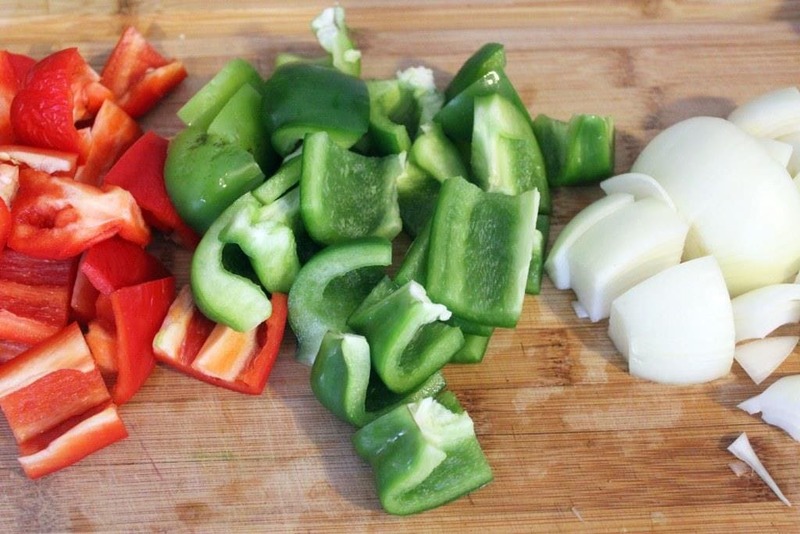 Sprinkle the veggies with a bit more seasoning blend. 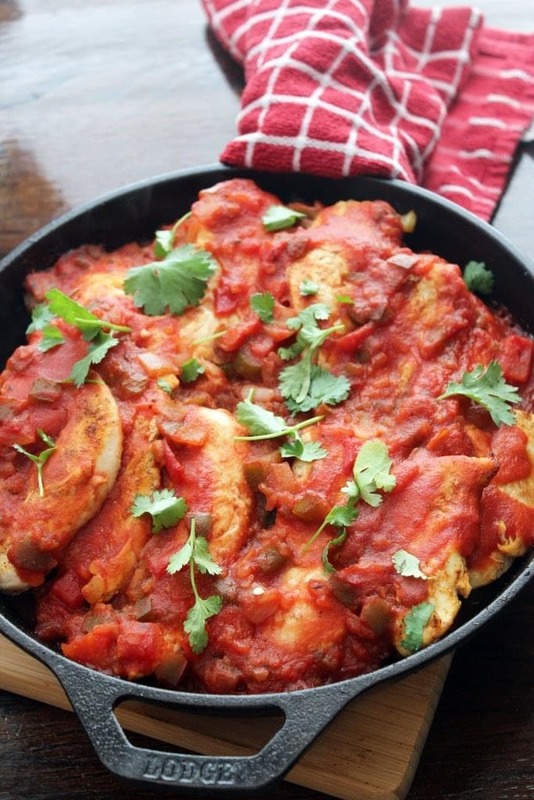 Arrange the browned chicken on top of the vegetables, and pour the salsa and tomato sauce on top. 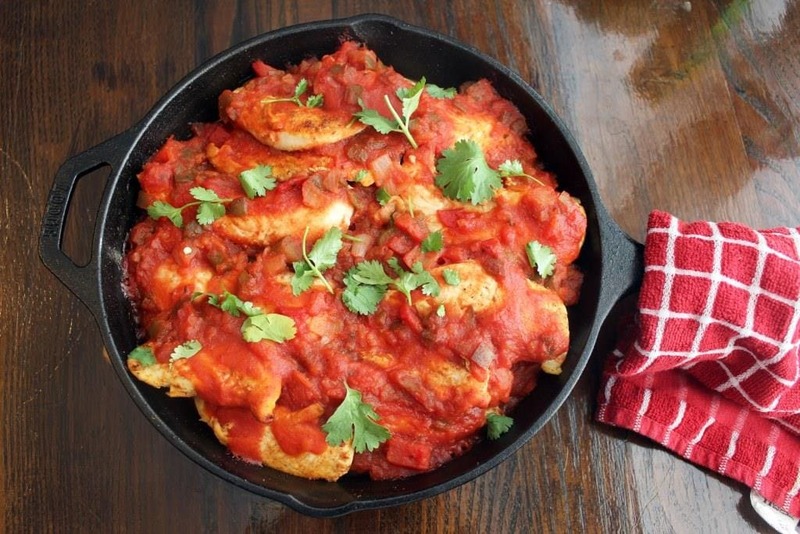 Bake the skillet at 400F for 15-20 minutes until the chicken is cooked through and the sauce is bubbly. 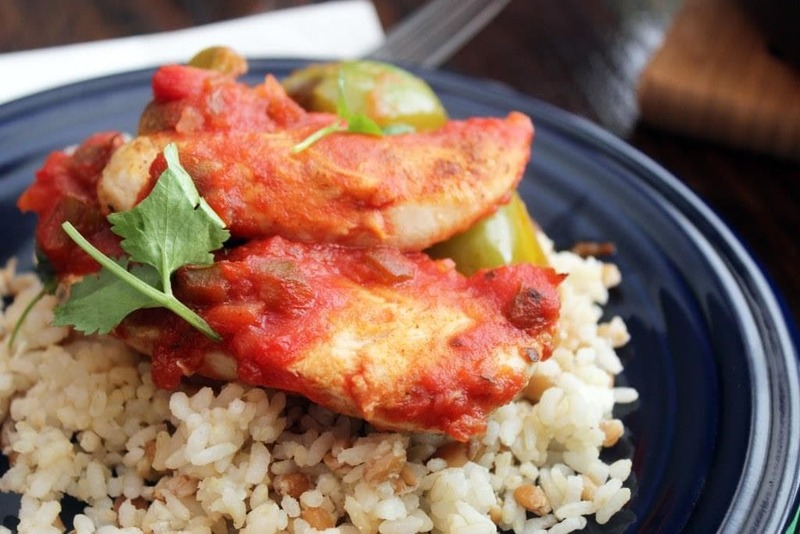 Serve with rice, salad, or any way you like. 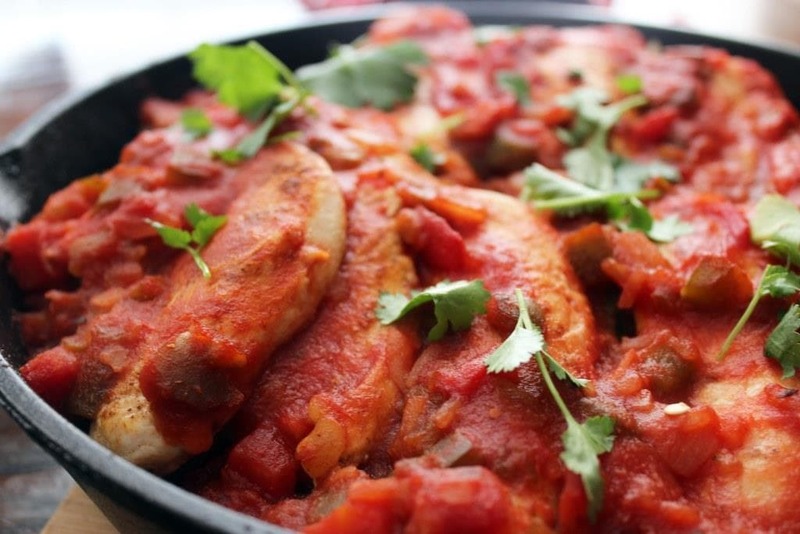 If you use larger pieces of chicken, increase the baking time to fully cook the chicken. If you don't have an ovenproof skillet, brown the meat in a skillet and set aside. Toss the veggies in the hot skillet to pick up any pan drippings, then arrange everything in a baking dish and bake until cooked through.